What Happened on December 16th, 1773? One of the most important dates in the history of the United States of America. On this night, the Sons of Liberty dumped more than 300 crates of East India Company tea into Boston Harbor. To many who were still loyal to the crown, this was an act of sedition and treason by “ill designing men”. But to those whose loyalty to King George III—and his taxes—had faltered; this was a galvanizing event. Bostonians from all statuses and walks of life came together, as equal citizens, to make a peaceful protest against tyranny and taxation without representation. It was their patriotism that sparked the American Revolution. For years, the colonies had been taxed without receiving equal representation in Parliament. The first direct tax on the colonies was the Stamp Act of 1765, taxing all paper goods. This would be followed by the Townsend Acts which taxed glass, lead, paint, and tea. 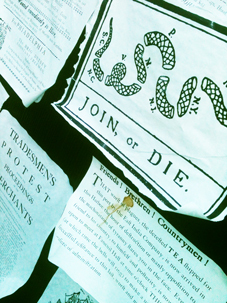 This taxation without representation led to protests, riots, and further unrest in an already tense city. The Boston Tea Party was the culmination of a series of meetings beginning on November 29, 1773—two days after the first of the three ships bearing East India Company tea arrived in Boston Harbor. The arrival of the Dartmouth, with her 114 chests of tea on board, sent Boston into a frenzy. 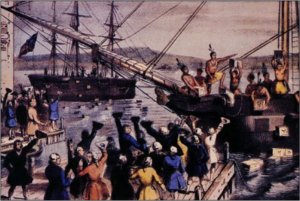 The Sons of Liberty demanded the tea be sent back to England, but those requests were refused by Royal Governor Thomas Hutchinson. A few days later, the ship Eleanor and brig Beaver arrived with more cargoes of tea. 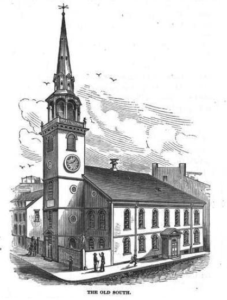 With the deadline to unload the tea looming, Bostonians met at Old South Meeting House on Thursday December 16, 1773 to decide the fate of the cursed East India Company Tea. It was still the hope of those assembled that a peaceable agreement could be reached. Francis Rotch, owner of the Beaver and Dartmouth, was sent to Milton to obtain a pass from the Royal Governor so that his ships could be sent safely past the guns of Castle Island, and back to England with the tea still onboard. When Rotch returned and gave word that this request was denied, a mighty cry echoed through the historic hall. Samuel Adams stood up and said “This meeting can do nothing more to save the country.” This was a secret signal to the Sons of Liberty. They sprang into action as hundreds of men, loosely disguised as Mohawks, marched to Griffin’s Wharf and into history.